We will proceed to Old Muscat, to visit Muttrah Souq, one of the most popular souqs in the Middle East.Take a walk in its labyrinthine alleyways beckoning with a myriad of merchandise, from imported fabrics to exotic Oriental spices, perfumes and richly handcrafted Artifacts. A visit to this frenetic, pulsating hub of Muscat’s old quarter makes for a delightful experience. 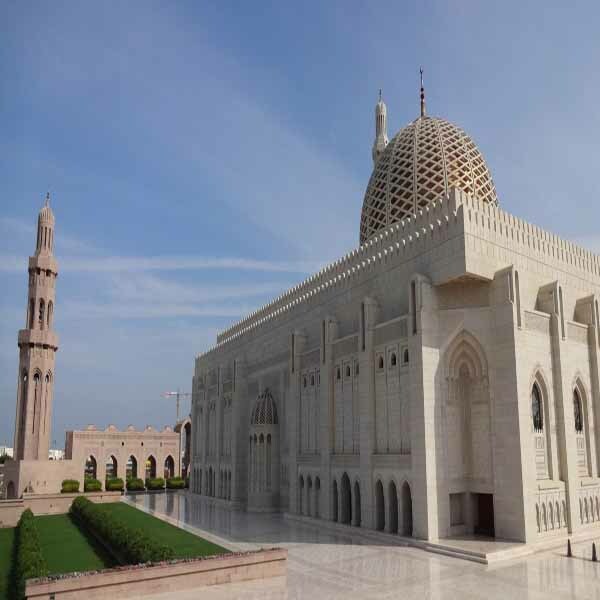 Next, guest will be taken for a visit to the magnificent Al Alam Palace, the official residence of His Majesty Sultan Qaboos Bin Said the ruler of Oman. 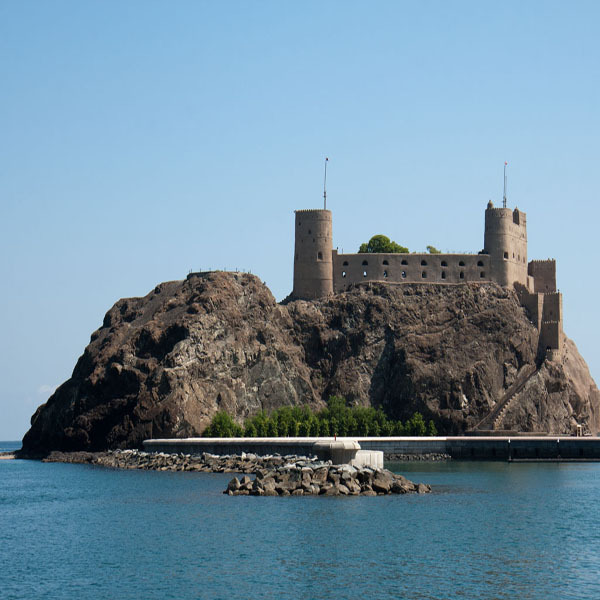 The palace is an architectural marvel for both its design and its location between the twin Portuguese forts Mirani and Jalali (A brief photograph stop from outside only).Any one of the Muscat Museum, after the tour, back to hotel. 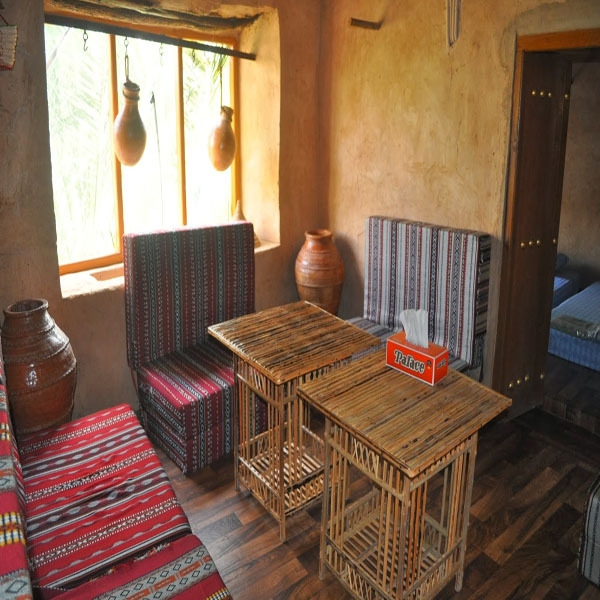 Guest will pick up from the hotel and we continue our drive through Wadi Bani Auf. It is an ancient wadi offering breathtaking vistas along its 26-kilometre trail. A little gap in the mountains, barely discernible from the main road, reveals the entrance to the wadi, which cuts a swathe deep into the mountainous terrain. Atop its craggy summit, a crumbling watchtower, picturesque in ruin, marks the entrance to the wadi. A short distance ahead, a splash of vivid green brings you to a delightful oasis village called Al Far'a. Nourished by an underground falaj, date palms and an assortment of other trees, grow rich and thick. It makes an enchanting sight amid the barrenness of the wadi. Vegetation is verdant for several kilometers along one side of the wadi, following the course of a perennially flowing falaj. Tucked away in the cool confines of this growth are the houses of local residents, shielded from the glare of the sun. On higher elevations along the wadi here, are the remains of stone houses, cobbled together with stones found on the wadi bed. Next stop will be in Jabal Shams. Jabal Shams is Oman’s highest peak, at 3,009 metres above sea level, Jabal Shams or Sun Mountain is located in the Wilayat of Al-Hamra .The summit is unreachable by public road which ends at 2,000m. At night the guests can camp at the Jabal Shams Resort and experience the wonders of a moonlit night, far away from the city lights. Guest will pick up from the hotel and we continue our drive to visit Jabal Akhdar, meaning “The Green Mountain” in Arabic, is part of the Al Hajar mountain range, one of Oman’s most spectacular regions. Perched here 2,000 metres above sea level, Alila Jabal Akhdar overlooks a dramatic gorge, surrounded by awe-inspiring views of the Al HajarMountains.The perfect base for exploring the region’s magnificent landscape of rugged, untouched beauty while staying in the height of sumptuous comfort. A heaven for adventure travelers, nature lovers and those seeking a retreat from the desert heat. 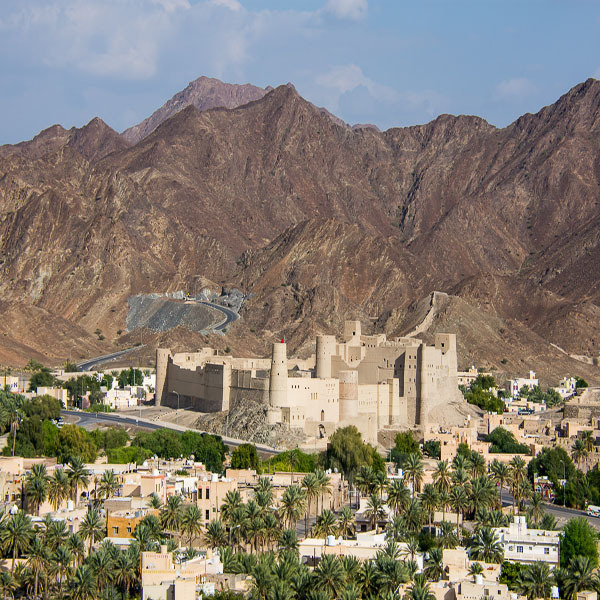 We continue our drive to visit Nizwa, tourist site par excellence and the first capital of the Sultanate of Oman in the sixth and seventh centuries.Nizwa has managed to retain its charm through the centuries with its strong and its guard tower that protects the city against invaders. This is the land of Imam Ibn Al Julanda first democratically appointed imam in the seventh century. Visit the fort surrounded by palm trees. 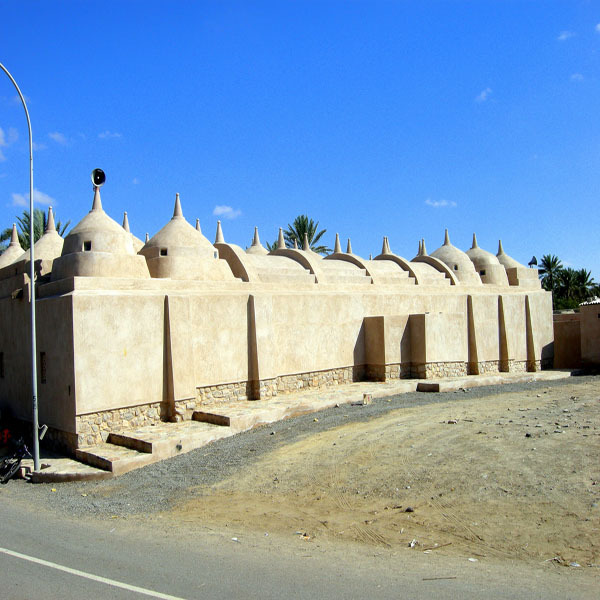 This fort built in the seventeenth century by Imam Sultan Bin Saif Al Ya'ruba. Nizwa Souq is the city, famous for its handicrafts and agricultural products, has an expansive souq with an array of products. The souq bustles with vendors selling everything from meat, fish, fruits and Nizwa is renowned for its silver jewelry which is considered to be the best in the country. Its people are masters in Khanjar making (curved dagger), recognized for its distinctive style and patterns. They also make copper ware, coffee pots, swords, leather goods and pottery. Next Stop will be in Jabrin. It is a small town in Ad Dakhiliyah Governorate in northeastern Oman. The town is known for its impressive castle, which was built by the Yaruba dynasty Imam Bil'arab Bin Sultan, who ruled from 1679 to 1692. Guest will pick up from the hotel and we continue our drive to visit Wadi Bani Khalid, for an easy walk along the riverbed with ample time to cool down in the crystal clear waters of the rock pools. It is the best-known wadi of the Sharqiyah region. Its stream mountains a constant flow of water throughout the year. Large pools of water and boulders are scattered along the course of the wadi. As a geographical area, WadiBani Khalid covers a large swathe of low land and mountains. Caves form some of the interesting features of this wadi. These include KahfMaqal which is one of the Sultanate's underground chambers. Springs of water are also common in this wadi. We will proceed to visit Jaalan Bani Bu Ali, it is one of the largest states of the province of South – East area and is located in the South-Eastern of the Sultanate of Oman. Photo Stop at Al Hamoda Mosque. Build in a beautifully simplistic style, the mosque’s 52 domes have hidden provision for ventilation. The domes, along with palm trees in the courtyard, contrast vividly with the blue of the sky. Falaj Al Dhahir bubbles through the courtyard where it is used for pre-prayer ablution and makes the areas cool and restful. Guest will pick up from the hotel and Today, client will star drive to coastal road to visit Sur; it is an ideal location in the northeast province of Sharquia and is a seafaring town, a fishing village and a trading port all in one. The highlight of the town is the dhow builder’s yard on the coast just beyond the town. Sur started trading activities with the African coast as early as the 16th century A.D. a drive through its labyrinthine streets reveals many fine old houses with caved doors, arabesque windows and other intricate details. We continue our drive to visit Wadi Tiwi.It is spread over an area of 36 kilometers (22.37 miles) at the foot of the mountain village of Mibam. It is a fertile wadi that meanders through a number of agricultural villages which grow dates and bananas overlooking the majestic mountains. You can also see the valley below, and the azure waters of the sea from some elevated locations.